Hampshire captain Colin Roope will go head-to-head with Rowland’s Castle’s Tom Robson when he defends his Courage Trophy title at Basingstoke on Sunday – when the pair will also fight it out for the county’s Order of Merit title. The pair will also fight it out for the county’s Order of Merit title. Roope has a 10-point lead as he defends the crown he claimed at Aldershot’s Army Golf Club 12 months ago. That is thanks to the 23.5 points he picked up in east Hampshire in August. But Robson, who became just the fifth player to land the Solent Slam in 25 years with wins in the Mike Smith Memorial and the Stoneham Trophy two weeks ago, has the advantage of being eligible for more bonus points in the Cole Scuttle than his rival. The players with the best combined scores in the Courage and the 36-hole qualifying at the county championship can earn up to 15 extra points – and that could be Robson’s trump card after he finished second at Liphook in June. County skipper Roope was outside the points in 12th. 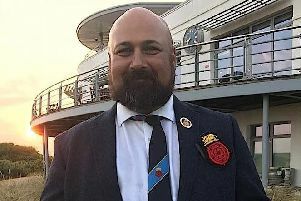 He will now need all of the 10-point advantage he currently has in order to win the Cullen Quaich he captured in 2016 – after switching from Surrey. Sunday’s winner will pick up 15 points plus any bonus in the Scuttle. Roope (74, 68) had to settle for fourth place in last Friday’s Blackmoor Bowl as Surrey teenager Thomas Spreadborough produced one of the most exciting rounds there since Andy Sullivan smashed the course record with a 60 in the 2011 Selborne Salver. The Farnham lad shot a remarkable five-under par 30 going out, including an albatross two at the par fifth eighth after holing his three-iron to come from eight shots back at lunch after a 75. A double bogey six at the last left Spreadborough on two-over. Hayling’s Toby Burden (71, 69) matched that – but then lost a play-off after hitting two shots out of bounds on the notorious 10th tee. Roope had fired a brilliant seven-under par 65 before lunch, only to come home in 78 in round two. 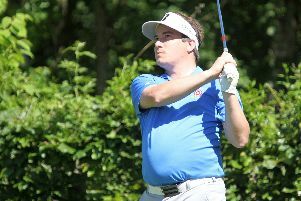 Robson, who is the assistant secretary at Rowlands Castle, was unable to play in either of the two east Hampshire events – which help make up the 11 tournaments that count towards the Order of Merit, which was launched in 2014.